So per @NBCNews, these are the latest fundraising rankings. These are significant because #Warren is after #Sanders and #Harris in the polls where they rank 1st and 2nd (not counting Biden since he's not in) but her fundraising is below #Booker. As these money rankings stay, Warren is in trouble for the debates like Castro and Gillibrand are because of the rules on how fundraising numbers = viability. Not making the debates would be terrible since #Warren & #Gillibrand are the most progressive & #Castro the only Latinx. 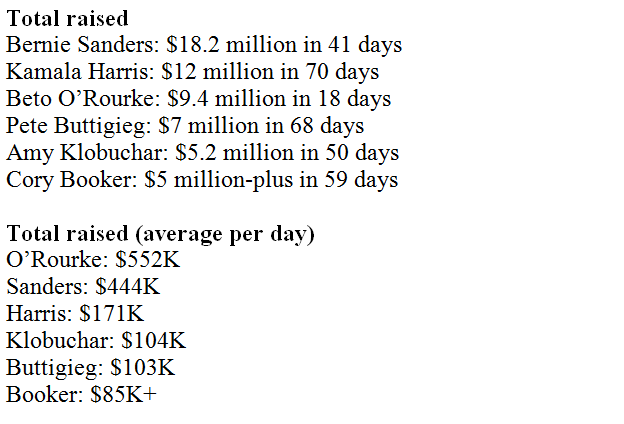 Also, these daily totals are averaged, but they aren't representative as a metric because all these candidates entered at different times & Sanders never stopped fundraising from 2016. The question is, how much is no big donors hurting #Harris & #Warren? Money was a stress for these women's families as well. Klobuchar has spoken movingly of her family's estrangement from her father, an alcoholic. But the coverage of these women not only hasn't reflected this awe of their families' struggles, but has been harshly critical. Democrats and Republicans, Independents and Greens should be fully supporting Tim right now and calling out the corruption loudly if he is cheated yet again. Canova is the singular progressive to finally fight the corrupt @DNC by calling out the voting interference for what it is & exiting the DNC system entirely. His **actions** are what strongly differentiate him from progressives like #Sanders & @Ocasio2018 who bow to the DNC. Now that @dougducey has supported #GrahamCassidy, @SenJohnMcCain has said he would be more likely to 💪 this #ACA repeal!